Savio 1 year, 10 months ago. Android Nougat 7.0 ROM for Galaxy S4 Mini LTE CM14 (CyanogenMod 14) has now arrived. For latest updates, stay tuned to the Lineage OS device list page. This Nougat 7.0 has come for Galaxy S4 Mini LTE via CyanogenMod 14 ROM. Since Google released Android Nougat Source code, we have update many Android NOUGAT AOSP ROMs and we also have a big list of Available CM14/CyanogenMod 14 Nougat 7.0 ROMs. This CM14 for Galaxy S4 Mini LTE (US Cellular) CM14 is brought to you by developer jason972000 and CM14 for Galaxy S4 Mini LTE International is brought to you by arco68. If you want to help developer’s then here are the donation links: Donate to arco68 using this link. Download and Copy the GApps and Galaxy S4 Mini LTE CyanogenMod 14 ROM ZIP to your phone. Reboot and Enjoy the CyanogenMod 14 Nougat ROM on Galaxy S4 Mini LTE. Copy the latest Galaxy S4 Mini LTE CyanogenMod 14 ROM ZIP file to your phone. Deve thread of Galaxy S4 Mini LTE CM14 ROM (International) by arco68 is here. hi will this rom work on the Galaxy S4 Mini LTE intl version GT-I9195? Hi, CM14 for Galaxy S4 MIni LTE International has been updated. You can try that one now. first thanks for the upload. It works super fine. is there a fix, or a list of video apps that work? I discovered “Camu” is working, but with like 2 fps, that’s not satisfying. There is no OFFICIAL NIGHTLY available yet but just stay tuned to the OFFICIAL CM14.1 devices list. It will be listed in the list when it is available. There is a new updated link of this ROM. You can try that and let all know if the video camera bug is fixed or not. Bonsoir l’équipe cyanogenmods s’il vous plaît quand CM 14 de S4 mini LTE sera disponible officiellement ? 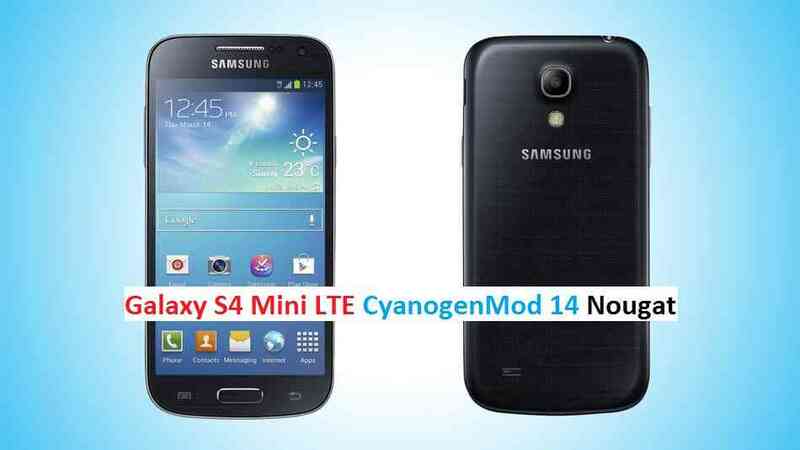 Good evening the cyanogenmods team , please when CM14 of S4 mini LTE will be officially available?